Last weekend I embarked on a mission to find the solution to my ehk so dry it’s peeling skin situation. The problem (as we all know) is it’s winter and furnace-generated heat is not a friend of your skin’s. Also, I use a retinal cream on my face before bed which really dries me out. So I did a little research, went to Sephora and then to Caudalie, where I was persuaded into purchasing the Energizing Concentrate with lavender and grape seed oil. Being that I fear breakouts and oil is pinned in my head as one of the number one causes, purchasing an oil for my face was definitely a leap of faith. But thus far, a very successful one. Beauty oils are all the rage at the moment. Take it from the girl who fears the grease - they are definitely worth a try. Think of it as the 2014 revamp of your everyday moisturizer, kind of like how dry oil is the new body butter. 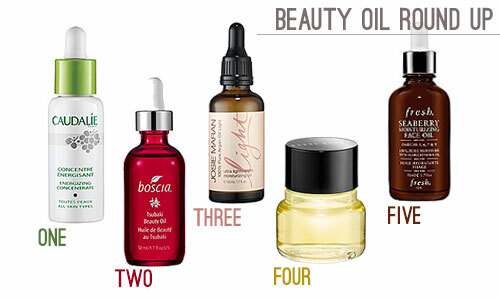 Above are a few beauty oil favorites. The various potential benefits: wrinkle reducing, paraben free, no residue, enhanced radiance and moisture without clogging pores. See which ones best fits your face and take. the. leap.